THAT is the core driver for the economic suffering that surrounds us. THAT is the motivation for Elizabeth Warren’s wealth tax. That wealth tax is also the motivation for the continuing and utterly vapid attacks on her from allegedly “liberal” media as well as the usual suspects. There’s been a lot of talk about “the top 1%”. This is TEN TIMES more rarified than that. The top ZERO POINT ONE percent — one in one THOUSAND — have captured TWENTY PERCENT of the nations wealth. more than the bottom EIGHTY PERCENT of the population COMBINED. It is no accident that the ENTIRE mainstream media — owned by the very wealthy — has replaced virtually all discussion of Ms. Warren’s popular wealth tax proposal with rubbish about meaningless paperwork filed decades ago. THIS IS THE BATTLE WE SHOULD FIGHT FOR 2020, STARTING NOW. While it’s true that the amount of wealth owned by the 400 richest Americans has tripled since 1980, it’s also true that the list of the top 400 richest Americans today has turned over quite a bit: that is to say, by and large, it is a different list. Warren Buffet and the Koch bothers are some of the few remaining at the top of the list since Forbes first published it’s ‘four hundred richest’ list (in 1982). Some of the other people on today’s list weren’t even millionaires in 1980, Jeff Bezos being the most prominent example (Amazon.com, the source of his wealth — and which wasn’t even subject to sales taxes for the greater span of its life — did not even come into existence until 1994). Why is this important? 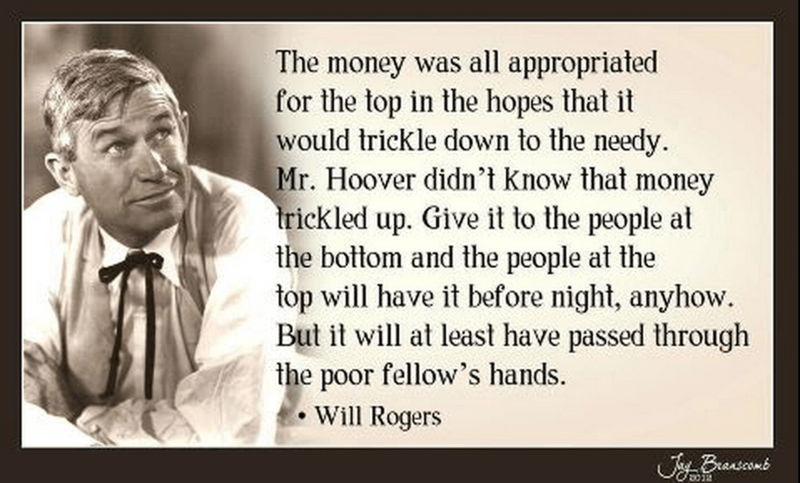 Well, it tells us something about the fallacy behind the Republicans ‘trickle down theory’ which reached actual power in, you guessed it, the early 1980’s; the notion that if people are unfettered from taxation they’ll have so much money they’ll have no choice but to create jobs and make life better for everyone. Heh. Yeah, they have more money but they don’t spend it in that way: now they may have more either to keep or to waste in extravagant ways. I don’t blame the very very rich (and largely very very insecure) for throwing their money away. I don’t blame the more secure rich for guarding their investments zealously such that there is no overflow. I blame the utterly febrile Republicans for their fantastically ill-judged ratiocinations of this kind of ‘economics.’ Allowing the aforementioned wealthy to either hoard more or recklessly spend more, which is the problem. So the experiment is over. Forty years ago (nearly) Ronald Reagan said let’s cut taxes and everybody will do better. That has not proven to be the case. All the data is in and is conclusive: more went to the top and, once there, it is either held tight or extravagantly wasted. When given more, either the wealthy have hoarded more or wasted more on pet ambitions. It’s not their fault. You or I, should we have chosen or been given that path, might have acted no differently. The problem is in the clear mistaken belief that it would or could be otherwise. Sixty years ago, however, the top marginal tax rates were well over 7o%. That didn’t seem to affect either Warren Buffet or the Koch bothers in any meaningful way… They still made the list. – The top marginal rates you refer to are for income taxes. The most apparent effect of steeply progressive marginal rates is to make it more difficult to enter the ranks of the wealthy. This may explain some of the turnover in the list of those at the very top. The only tax that America has ever applied to the wealthy and very wealthy is the estate and gift tax. The highest marginal rate of the gift and estate tax was 76% — from 1940 to 1976. Republicans and Democrats alike have lowered that, year after year, while simultaneously raising the threshold for which it applies. The most recent proposal from Bernie Sanders does not, to my knowledge, suggest any increase in the top marginal rate. His proposal instead reduces the threshold. We should instead keep the threshold untouched and restore the top marginal rate to 76%. We really MUST maintain a laser focus on taxing extreme WEALTH. That is the source of our economic suffering today. Democrats played a role in this as well. Sure, not as openly and not as proudly, but clearly played a role here and there over the last four decades. One famous married couple, both Democrats now retired from office, went from “bankrupt” to members of the .01% in a matter of a few years taking advantage of laws/tax policy that they, no doubt, had a role in forming. I’ve said it before and I will continue to say it, Senator Warren’s chances of winning in 2020 will greatly increase of the public views her as someone brave enough and honest enough to call shame on both parties and yes, name names. We’ve already discussed that married couple at great length. Discussion of that couple is irrelevant to the 2020 campaign and will hurt, rather than help, Ms. Warren’s presidential hopes. There are about 75,000 names on the list of people whose net worth exceeds the $50 M threshold of Ms. Warren’s wealth tax. We should not trivialize the discussion by further slander of one of those names. Trump won by exposing the hypocrisy of the Bush dynasty and others. Yeah, let’s not learn from his victory. Let’s try doing the same thing this time and hope for a different outcome. Let’s spend even more time demonizing our last nominee and her entire family, because that demonizing was so effective in winning the 2016 election. My question to Democrats running for office is this: What sort of education and job skills does this demographic of 0.1% have that, by your line of reasoning, led to them acquiring such wealth? Are these skills teachable in our vocational schools and can one gain this education in our public schools? Please take that to a different thread. This thread is about wealth concentration. And by what means is it being “concentrated”? I say it’s a combination of tax code, labor code, trade agreements, and copyright/patent policy……in other words, all pieces of legislation that Republicans and Democrats alike have signed into law. When and only when a Democrat admits this to the working class voter, will we have a decent shot at getting Trump out of office in 2020. Blaming “technology” or offering “Free College” is not the path to 1600 Pennsylvania Avenue. What did you mean by “THIS IS THE BATTLE WE SHOULD FIGHT FOR 2020, STARTING NOW.” if not a path to the White House? I am confused. I meant that wealth concentration must be the central issue of the 2020 campaign. This is a thread about wealth concentration. Once more, with feeling — INCOME. IS. NOT. WEALTH. We are discussing WEALTH concentration here. When JFK said that, the top federal income tax margin was 91%. He proposed lowering that to “only” 70%. The threshold for that bracket was $1.6M US dollars. Today, that same rate is 37%, for incomes of $600,001 or more. In 1963, the maximum estate tax rate was 77%. The estate tax exemption was $500,000 in 2018 dollars. The annual gift tax exemption was $25,000 2018 dollars, and the maximum gift tax rate was 58%. The current estate tax rate is 40%, and the estate tax exemption is $11,400,000. I hate to see false equivalences.